Home > News Articles > We’ve got solutions to your resolutions! In January we're helping you achieve your New Year resolutions with daily tips and event opportunities! Each week on Facebook and Twitter we’ll be offering you “Solutions to your Resolutions” by featuring a different fundraising event and posting tips related to that event activity. If you’re not following us yet, then now is the time! We’ve already started posting tips and there will be prizes to win each week with our competitions. This week we’re recruiting for our Everest Base Camp trek – offering two people the chance to take part in a once in a lifetime trip to Nepal and raise vital funds to help struggling families in the UK and Nepal. Next week we will be featuring the iconic Virgin Money London Marathon! We only have a few places left so if you or someone you know would like to join ‘Team Starfish’ in this event then apply today. 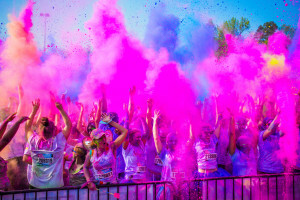 The Color Vibe 5K is the perfect event to take part in and have fun with friends. Taking place in 4 locations around the country, and with walkers welcome too, you’ll be blasted at every colour station in this untimed race. Get ahead of the crowd and apply now to take part in Ride London. With leg-testing climbs and a route made famous at the London 2012 Olympics, it’s a truly spectacular event for all involved.